On one of the crazy quilting on-line groups I am in, we were discussing storage systems for our crazy quilting fabrics. 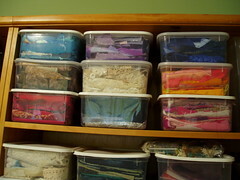 Here's my method - simple clear plastic containers holding 6 inch squares of fabric sorted by colour. My beads are are in clear containers with divided sections - also sorted by colour. I find it helpful to always cut my material up into 6 inch squares straight away so I don't finish up with a pile of second hand clothes, yardage fabrics and odd shaped pieces.